Never has there been a time when an understanding of science has been more important to the well-being of individuals and to the nation than the present. Yet many recent studies have documented a lack of interest in science and hence a decline in science literacy in the United States. To address this problem, the University of Wisconsin - Madison in 1984 began a program called The Wonders of Physics aimed at generating interest in physics among people of all ages and backgrounds. 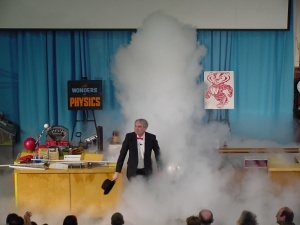 The heart of the program is a fast-paced presentation of physics demonstrations carefully chosen to be entertaining as well as educational. Video DVDs of past presentations of The Wonders of Physics are available for purchase for $25 each or $600 for the entire set (postpaid in the U.S.) from the University of Wisconsin Department of Physics, 1150 University Avenue, Madison, WI 53706-1390. Call (608) 262-2927 or e-mail [email protected] to order or for further details. cosmobc wrote 10 years ago. CosmoLearning is promoting these materials solely for nonprofit educational purposes, and to recognize contributions made by University of Wisconsin (University of Wisconsin) to online education. We do not host or upload any copyrighted materials, including videos hosted on video websites like YouTube*, unless with explicit permission from the author(s). All intellectual property rights are reserved to University of Wisconsin and involved parties. CosmoLearning is not endorsed by University of Wisconsin, and we are not affiliated with them, unless otherwise specified. Any questions, claims or concerns regarding this content should be directed to their creator(s).